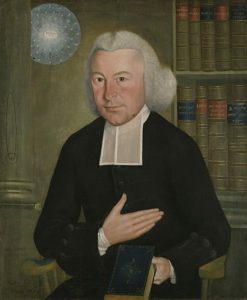 Ezra Stiles continues the depth of living the Extensibility of the Gospel: — His Prophecy respecting the Colonies, in 1760. — President of Yale College. — Chancellor Kent’s Eulogy of him. — His Patriotism. — Keeps a Diary of Revolutionary Events.—His Death..
Ezra Stiles succeeded Dr. Dagget as President of Yale and continued the patriotism regarding what is lost in modern times – Christianity (religion) and fighting tyranny go hand in hand. Hence it can be noted that Ezra Stiles completes ‘the illustrious trio of patriotic Presidents’ that Yale should boast of instead of cowering in socialism and neo-marxism of our present. As a reminder, the trio mentioned are the last two chapters: Dwight and Dagget, and this on Stiles. Without a doubt we need Pastors, professors as well as institutional leadership as exemplified by Ezra Stiles and his predecessors.